Early today Forbes ran a semi-serious piece about how men should avoid marrying a career woman with all sorts of documentation as to why it was a bad idea. The article suddenly disappeared from the site the bloggers were all over the disappearance as an example of political correctness. Next thing you know the piece is back up much later in the day with a retort point-counter-point piece by Elizabeth Corcoran saying that men should work out more and quit complaining. So what happened? I went to some friends inside Forbes to get the scoop. Here’s the story. Apparently this article by Mike Noer ran online with none of the editors thinking it was that big of a deal. 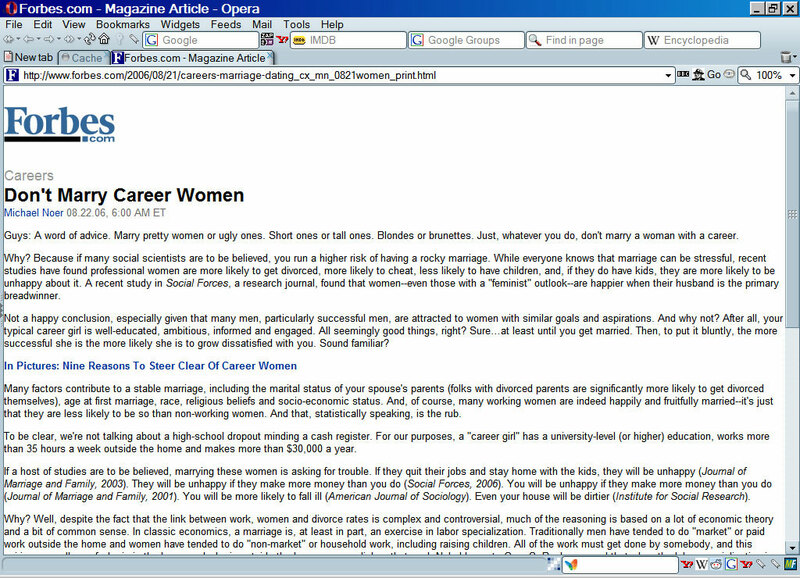 The article was a romp that discussed why men should not marry a career woman with commentary and disclaimers everywhere. Boing-boing got hold of some screenshots of the original piece before the Political Correctness Police took it down. Click Here. Having worked at Forbes I can assure you that the article was edited and went through channels before publishing. Forbes is not a blog. Furthermore the editors all toe a certain righteous line regarding facts and exactly how to present material. It’s kind of old-fashioned, but nothing slips though. SO this had to be taken down only because of someone phoning someone or one of the women in sales getting P-O’d about the article. Having seen “P-O’d women in sales” myself, I suspect it was the latter. Whatever the case the stink rose fast and Forbes backed down and republished the piece with an Elizabeth Corcoran “Counterpoint” making the whole episode laughable. The final cut is here. Apparently what had happened was that morning, right after the piece ran, Good Morning America, the Today Show and even Oprah Winfrey’s show began to call the Forbes folks wondering what this was all about and if they could book Noer. This got everyone into a tizzy. I mean when does Forbes get so much attention? Then about three or four things happened at once. The first was Corcoran apparently writing up her retort to be published as a counterpoint without any prompting whatsoever. Everyone thought this would be a good idea and when they looked the original piece had been taken down. Apparently an editor got antsy. Worse, it had disappeared from the system and nobody knew who did it. As far as I can tell they still don’t know who did it but it should be easy enough to track. The PR folks flipped since the bloggers were all over the fact that the article had been taken down for “political correctness.” At least that is the way they saw it. The ad folks couldn’t be happy. All the links to the piece were offsite with copies of the original article appearing on LiveJournal and elsewhere — to be read there. By the time Forbes finally found a copy of the article and reposted it next to Corcoron’s rebuttal (here) the bloggers had all moved on to a new target to attack and few even know the original piece is back up. Wow, this new blogosphere is fickle! They are in; they are gone. As an aside Corcoron’s piece was not a satisfying article for those on the other side of this debate beginning with the words, “Studies aside…” Well, it was about studies. That’s the point of the Noer piece. Point totals in this one. Boys 1 Girls 0 – sorry. Realtors have been told by the PC police that the term walk-in closet is inappropriate to use because it discriminates against “wheelchair-bound persons,” and the term master bedroom infers slavery. Easter vacation is now spring break and Christmas is winter break. You can’t sing traditional Carols in our public schools any more, although you can have your Junior High student take on a Muslim name, bow down to recite prayers to Allah, and then play Jihad. Why is it that only the right-wingers are fighting this battle against newspeak, er, politically correctness? Left-wingers dislike it and I believe they coined the term. But they never do much about it. Meanwhile it’s existence is killing them. Baffling.